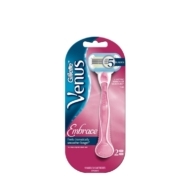 Reveal touchably smooth legs without the razor burn. Our first women’s razor created with 5 blades hugs every curve to get virtually every hair—and it even shaves bikini hair. The results are beautiful legs, an ultra-close shave and unsurpassed Venus smoothness.